Two linked molecular motors are used to pump protons across membranes. Vacuolar ATPase. The membrane is shown schematically in gray. This entry also includes a bacterial inhibitory protein, which is not shown in this illustration. We normally think of acids as being dangerously corrosive, but cells use carefully controlled acidity for a variety of useful things. For example, our cells use special receptors to gather molecules like LDL (low density lipoprotein) from the blood, and then after they are drawn inside in vesicles, they are released by acidifying the vesicle. Lysosomes are acidified to help break down damaged or obsolete molecules. Acidity is also occasionally useful outside cells. For example, bone cells use acid to break down and remodel our mineral-rich bones. One way that cells control acidity is to use pumps to increase the concentration of protons (hydrogen ions) in a compartment. The vacuolar ATPase (V-ATPase) is an ATP-powered proton pump composed of two rotary motors, as shown here from PDB entry 5vox. The portion at the top (shown in pink) is an ATP-driven motor that turns an axle (shown in dark blue). This then turns a second motor (light blue and magenta) that pumps protons across the membrane. The remaining protein chains (shown in orange) hold the whole complex together and make sure that the rotation of one motor is used to power the rotation of the other. Of course, cells need to control these pumps, to make sure that they don’t over-acidify cellular compartments. Amazingly, V-ATPase is regulated by breaking the complex in half when it is not needed. The ATP-powered motor separates from the proton pumping motor, stopping the process. Then, when they are needed again, they are reconnected and pumping restarts. These types of linked rotary motors have proven very useful, and are built in several varieties. V-ATPases are made by eukaryotic cells and are used to control acidity. ATP synthase (PDB entry 5ara) is found in our mitochondria and also in bacteria, and is used for the opposite function: using a flow of protons through the membrane-bound portion to build ATP. 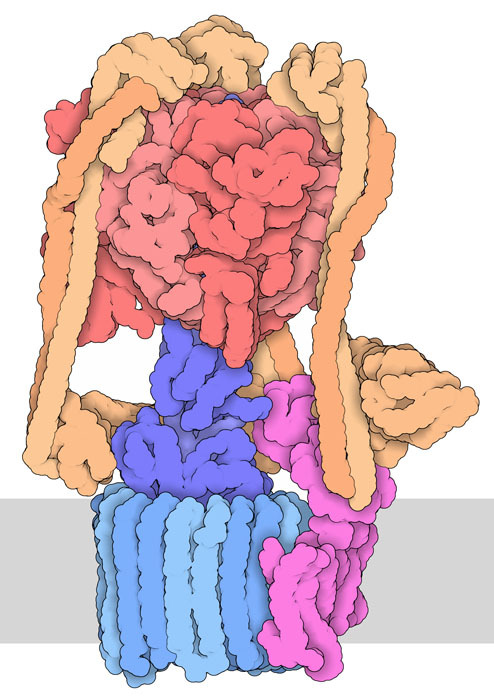 V/A-ATPases (PDB entry 5gar) have a variety of functions, as proton pumps or ATP generators. As an additional twist, some of these rotary pumps use sodium ions instead of protons. V-ATPases are complex molecular machines with many moving parts, so they have proven difficult to study. Currently, the most complete structures have been obtained by cryoelectron microscopy. The one shown here is from yeast, and researchers determined structures for three different rotational states of the complex (PDB entries 5vox, 5voy & 5voz). The image shown here is looking at the molecule from the bottom, showing rotation of the proton-pumping portion. To see the rotation of the whole molecule, click on the image for an interactive JSmol. 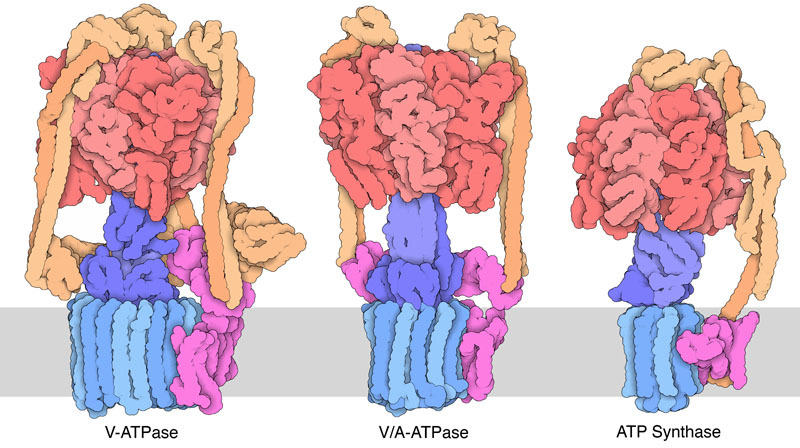 Try comparing the number of subunits in the ring of V-ATPases, V/A-ATPases and ATP synthase. What does this tell you about the number of protons needed for each ATP that is broken down or built by the molecule? Atomic structures have been determined for many fragments of V-ATPases, which were then used to help build the low-resolution models obtained from cryoelectron microscropy. You can search for “V-ATPase” to look at some of these atomic structures. 5vox, 5voy, 5voz: J Zhao, K Beyrakhova, Y Liu, CP Alvarez, SA Bueler, L Xu, C Xu, MT Boniecki, V Kanelis, ZQ Luo, M Cygler & JL Rubinstein (2017) Molecular basis for the binding and modulation of V-ATPase by a bacterial effector protein. PLoS Pathogens 13, e1006394. 5gar: DG Schep, J Zhao & JL Rubinstein (2017) Models for the a subunits of the Thermus thermophilus V/A-ATPase and Saccharomyces cerevisiae V-ATPase enzymes by cryo-EM and evolutionary covariance. Proceedings of the National Academy of Science USA 113, 3245-3250. 5ara: A Zhou, A Rohou, DG Schep, JV Bason, MG Montgomery, JE Walker, N Grigorieff & JL Rubinstein (2015) Structure and conformational states of the bovine mitochondrial ATP synthase by cryo-EM. Elife 4, e10180.